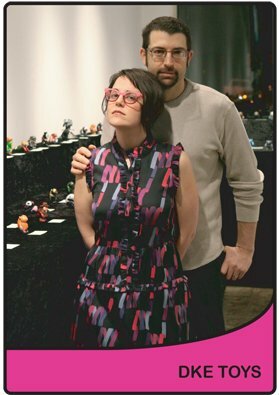 Dov Kelemer & Sarah Jo Marks are Co-Founders of DKE Toys which was the largest independent wholesale distributor of designer toys, limited edition art objects, collectibles, and gifts in the world exclusively representing hundreds of artists, designers, and boutique manufacturers. As of February 1st, 2016 the wholesale distribution arm of the business was sold to Disburst Ltd. Currently DKE Toys does about 4 conventions a year in which artists from all over the world create limited artist edition figures. Each piece is generally made out of hand poured resin and many are hand painted on custom printed (and sometimes hand drawn) card backs. Sometimes as many as 20 different artists participate in a given show. Many have commented that the DKE booth at these various shows look like a small art exhibition. While these figures are generally referred to as “bootlegs” they are far from pirated versions of mass marketed toys. Each of these artists use transformative properties in their work to communicate ideas that are often political, parody, or commentary about the pop culture world we live in. Also please do not be confused by the word “toy”. These are works of art!!! Do not give to a child to play with. They will break, get ruined, and hurt your children physically and emotionally. In addition Dov handles vendor relations and product development part time for Disburst as well as curates art shows, writes books, appraises and buys collections and toy closeouts of all shapes and sizes.